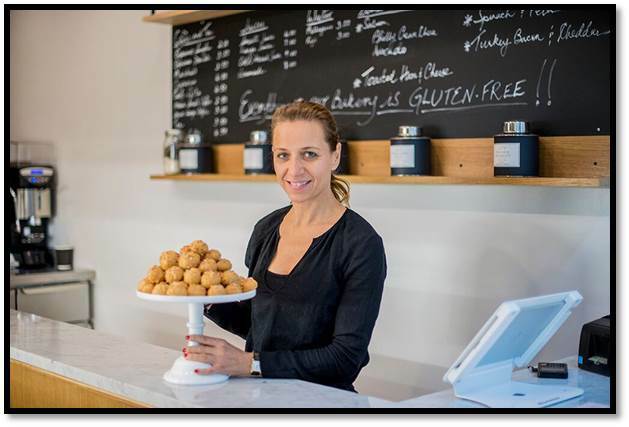 Chef Frederique Jules is the chef and owner of Noglu, a completely gluten-free restaurant with locations in Paris and New York. I’m traveling a lot. As a person with celiac disease, I can’t eat anything good in the airports, planes and sometimes in cities. 15 years now: they don’t need a fridge, they can survive a long time in my bag, office or kitchen, and they are also a good snack for my kids in emergencies. I use seeds from morning ‘til night! In my granola, inside salads, in soy yogurt for a snack or to top pasta. Seeds are full of good nutrients. I love their crunchy texture, and they stave off hunger! When I have to go to a restaurant with family or friends or for business outside of Noglu in Paris, I try to suggest restaurants where I know the chef. It’s so pleasant to not worry about ingredients or be afraid of getting sick. Japanese and vegetarian restaurants also work. I’m very careful to order simple plates like fish, vegetables or salads (without croutons). I completely ignore desserts, bread, amuse bouches and a lot of other very tempting things, but I enjoy being there and don’t want to focus on my gluten intolerance during the meal. A lot of restaurants now offer gluten-free options, and if I’m still hungry after the lunch, I know that my rice crackers will save me in the afternoon. 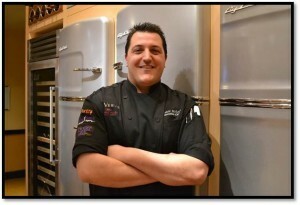 Chef Alastair Mclean is the executive chef at Pantry in Natick, Massachusetts. He makes his best effort to accommodate gluten-free diners and has hosted a completely gluten-free dinner at his restaurant. to enjoy fresh ingredients without the substitution shuffle. of dish is usually quick to prepare and offers the powerful flavors of lemongrass, ginger and cilantro to excite the palate. Recently my favorite product is cassava flour. It’s great for thickening sauces, and it’s nut free, vegan and Paleo. I’ve found that most of the time it’s a 1:1 substitute for wheat flour. Watch out for xanthan gum. Although xanthan gum is great and it has a lot of uses, be careful of the amount found in your gluten-free flour or try to find one without any in it. The gum is used to bind ingredients, but it can cause whatever you’re making to become…well…gummy. This is especially true in cakes, breads and pancakes. I’m not saying to skip it all together, just be cautious of the amount! [Gluten-free] guests are putting a lot of trust into the chef and the rest of the team. The trust is relying on the server to know the menu, pass the information to the kitchen and for the kitchen to react correctly to the order. I suggest asking for the chef or the manager. This cuts out the game of telephone and gives the chef a chance to offer the gluten-free alternatives and give detailed information on how the food was prepared. 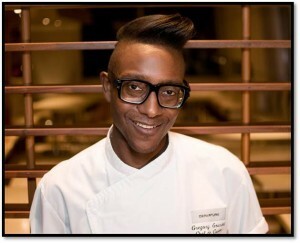 Chef Gregory Gourdet is the executive chef at Departure in Portland, Oregon. 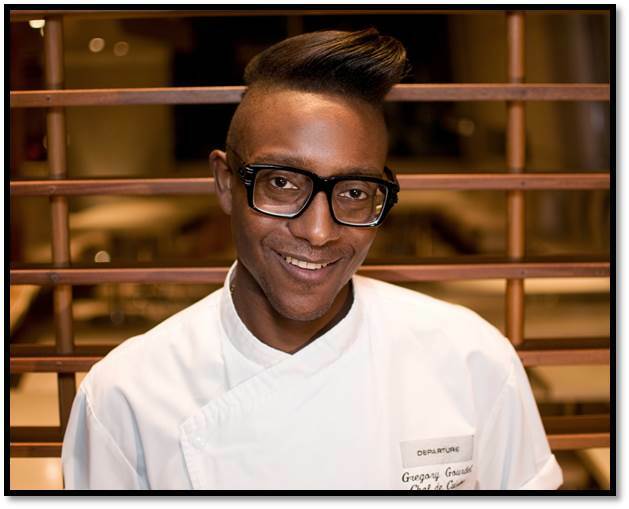 A Top Chef finalist in season 12, Chef Gourdet was named Chef of the Year by the Oregon Department of Agriculture in 2013. Tamari is a great substitute for soy sauce as it imparts the same great umami flavor but is gluten free. Also, most tamaris are organic. our tart dough, we use a blend of coconut and tapioca flour in our pancakes, and I’ve found almond flour lends itself well to cakes and cookies. I think it’s important to remember not all flour blends are created equal and it does take some experimenting to find the flavors and textures that work best. I would [also] suggest really paying attention to baking and cooking times when working with gluten-free flours. Asian specialty store or natural grocer. I’ve also made Korean potato starch noodles made from sweet potato flour. They are translucent when cooked and have a nice chewy, bouncy texture. They also absorb flavors beautifully and can be served warm or cold. With my experience working with Asian cuisines, I can definitely vouch that the food is great for gluten-free diets. Especially Thai food. It is very rice and rice noodle based, and a lot of flavors come from fish sauce—another great sauce to add flavor without adding gluten. also focuses on vegetables as well as meats, seafoods and different oils to add flavor.